When I came to the end of A Midnight Carol by Patricia K. Davis, I wanted to turn back to the first page and read it all over again. I liked it that much! This is a delightful, historical fiction based on Charles Dickens and the creation of his famous story The Christmas Carol. The novel is populated with vividly described characters, both real and imaginary. It provides insight into the political climate during the time in which Dickens lived and when he wrote his beloved stories, still treasured to this day. A Midnight Carol was published in 1999 and I intend to acquire a copy with a grateful heart to add to my collection of holiday books. It is a keeper. 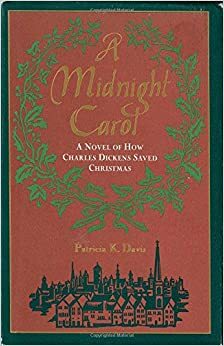 This entry was posted in books, Holidays, literature, reviews and tagged A midnight carol, charles dickens, Christmas, holidays, patricia k davis, the christmas carol, tradition. Bookmark the permalink.